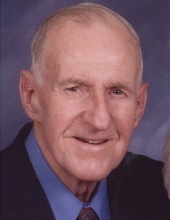 Gerald Ralph Hayes was born July 20, 1929 in Eastview, Oklahoma, and left this world on November 30, 2018, in Oklahoma City, Oklahoma, with many family and friends at his side. He was preceded in death by his parents, William H and Doma Sewell Hayes, his one sister, Leona Johnson, and six brothers, Cecil, Carl, Leon, James, Wayne, and Joe Hayes. Ralph is survived by his wife, Betty Hayes; 4 children, Randy Hayes, Rhonda Miles (with husband Johnny), Renee Guthery (with husband Ken), Regina Hahn (with husband Doug), and a niece, who was more like another daughter, Robin Collins (with husband Russell); 19 grandchildren, Ian Hayes (with wife April), Nicole Bernard, Payton Hayes, Carly Hayes, Andy Guthery (with wife Danielle), Duane Guthery (with wife Brittany), Dalton Guthery, Garrett Guthery, Caleb Miles, Hannah Miles, Leah Anderson (with husband Brandon), Kaitlin Hahn, Robby Hahn, Gage Hahn, Luke Hahn, Mackenzie Hahn, Zoe Hahn, Dougie Hahn, and Levi Hahn; 9 great grandchildren; many nieces and nephews; 4 sisters-in-law, Ethel Hayes, Bea Card, Mae Hill, and Chiyoko Card; and 1 brother-in-law, Archie Card. Ralph lived a full life. He joined the military and served in the Korean War while in the US Army. On December 19, 1953, he married Betty Jean Card. Upon his death, they lacked 20 days of having been married for 65 years. Soon after marriage, Ralph and Betty moved to Midwest City, Oklahoma, where he worked at Tinker AFB for 33 years as a civil servant. His retirement was short-lived. He soon started working with the transportation department of the Mid-Del school district and did so for 28 years. Throughout all of those years, his love for and commitment to the Lord was always apparent. Aside from going on mission trips, teaching Bible classes at church, being engaged in personal evangelism, and serving on the missions committee, he also occupied leadership positions, first as a deacon and then as an elder at Ridgecrest Church of Christ. Family time was also important to Ralph. Some of the most memorable family moments took place on summer vacations, which always included a jaunt through Colorado, even if the destination was Maine, because Colorado was his favorite of all the states. Whether as a son, soldier, employee, husband, parent or church leader, Ralph demonstrated the kind of role model that I personally admired and have tried to live into. Whatever he did, he did responsibly and faithfully. For the 33 years that I’ve been a member of this family, Ralph and I discussed many religious topics. One of those topics I especially remember had to do with the Christian Sabbath. Now, Ralph, you get to enter into that much-deserved Sabbath rest with our heavenly father. Services to remember Gerald will be Tuesday, December 4, 2018, 10:00 am at Ridgecrest Church of Christ, 500 N. Air Depot, Midwest City, OK with burial to follow at Arlington Memory Gardens. Services are under the care of Barnes Friederich Funeral Home. To send flowers or a remembrance gift to the family of Gerald R Hayes, please visit our Tribute Store. 500 N. Air Depot Blvd. "Email Address" would like to share the life celebration of Gerald R Hayes. Click on the "link" to go to share a favorite memory or leave a condolence message for the family.